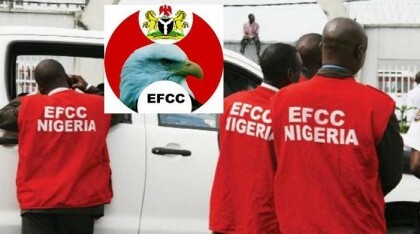 Operatives of the EFCC have arrested Ibanga Ime Akpabio, cousin to the former Akwa Ibom Governor, Godswill Akpabio for his involvement in a N10, 000,000.00( Ten Million Naira) oil scam. He was arrested in Port Harcourt, Rivers State. Akpabio’s arrest was occasioned by an allegation that he collected a sum of N10,000,000.00 from a potential investor in petroleum products. Specifically, Akpabio reportedly approached the investor to invest the money as equity in the purchase of petroleum product directly from a floating station belonging to the Nigerian National Petroleum Corporation, NNPC. He allegedly assured the investor that he had secured all necessary approvals for the running of the business. He allegedly collected the money through a Diamond Account being operated by Fastej Enterprises and neither kept faith with the business arrangements with the investor nor returned his money to him. He is currently undergoing interrogation in the Port Harcourt’s Zonal office of the EFCC.